Welcome to the Gallery pages of our circus. 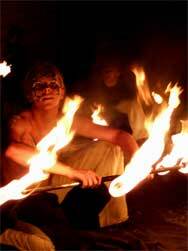 Will-o'-the-Wisp has performed at over 200 festivals and events within Australia, and toured all over the world. Here we share a few show memories dating from our early performances in 2004 to present day acts. On this page there are photos of our fire hula hoops, fire sword and human pyramid acts from Woodford Folk Festival, Port Fairy Folk Festival and our Majors Creek fire show. Please feel free to click on the photos to see a larger version of the image. Print quality photos are available by emailing us at the Will-o'-the-Wisp office.